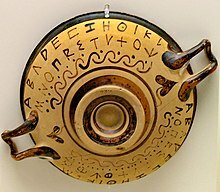 This article is about the Greek letter. For other uses, see Theta (disambiguation). "θ" redirects here. For the letter used in IPA, see Voiceless dental fricative. Not to be confused with Fita. For similar symbols, see Ø (disambiguation). Theta (UK: /ˈθiːtə/, US: /ˈθeɪtə/; uppercase Θ or ϴ, lowercase θ (which resembles digit 0 with horizontal line) or ϑ; Ancient Greek: θῆτα thē̂ta [tʰɛ̂ːta]; Modern: θήτα thī́ta [ˈθita]) is the eighth letter of the Greek alphabet, derived from the Phoenician letter Teth . In the system of Greek numerals it has the value 9. The alphabet on a black figure vessel, with a point-and-circle theta. In Ancient Greek, θ represented the aspirated voiceless dental plosive /t̪ʰ/, but in Modern Greek it represents the voiceless dental fricative /θ/. In its archaic form, θ was written as a cross within a circle (as in the Etruscan or ), and later, as a line or point in circle ( or ). Archaic crossed forms of theta are seen in the wheel letters of Linear A and Linear B. The cursive form ϑ was retained by Unicode as U+03D1 ϑ "GREEK THETA SYMBOL" ("=script theta"), separate from U+03B8 θ "GREEK SMALL LETTER THETA". For the purpose of writing Greek text, the two can be font variants of a single character, but θ and ϑ are also used as distinct symbols in technical and mathematical contexts. The name ARAÐÐOVNA on a Gaulish tombstone. In Latin script used for the Gaulish language, theta developed into the tau gallicum, conventionally transliterated as Ð (eth), although the bar extends across the centre of the letter. The phonetic value of the tau gallicum is thought to have been [t͡s]. The early Cyrillic letter fita (Ѳ, ѳ) developed from θ. This letter existed in the Russian alphabet until the 1918 Russian orthography reform. In the International Phonetic Alphabet (IPA), [θ] represents the voiceless dental fricative, as in thick or thin. It does not represent the consonant in the, which is the voiced dental fricative. A similar-looking symbol, [ɵ], which is described as a lowercase barred o, indicates in the IPA a close-mid central rounded vowel. In ancient times, Tau was used as a symbol for life or resurrection, whereas the eighth letter of the Greek alphabet, theta, was considered the symbol of death. According to Porphyry of Tyros, the Egyptians used an X within a circle as a symbol of the soul; having a value of nine, it was used as a symbol for Ennead. Johannes Lydus says that the Egyptians used a symbol for Kosmos in the form of theta, with a fiery circle representing the world, and a snake spanning the middle representing Agathos Daimon (literally: good spirit). The Egyptians also used the symbol of a point within a circle ( , the sun disc) to represent the sun, which might be a possible origin of its use as the Sun's astrological glyph. It is worthwhile to note that θῆτα (theta) has the same numerical value in isopsephy as Ηλιος (Helios): 318. In classical Athens, it was used as an abbreviation for the Greek θάνατος (thanatos, “death”) and as it vaguely resembles a human skull, theta was used as a warning symbol of death, in the same way that skull and crossbones are used in modern times. 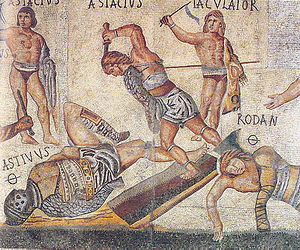 It survives on potsherds used by Athenians when voting for the death penalty. Petrus de Dacia in a document from 1291 relates the idea that theta was used to brand criminals as empty ciphers, and the branding rod was affixed to the crossbar spanning the circle. For this reason, use of the number theta was sometimes avoided where the connotation was felt to be unlucky—the mint marks of some Late Imperial Roman coins famously have the sum ΔΕ or ΕΔ (delta and epsilon, that is 4 and 5) substituted as a euphemism where a Θ (9) would otherwise be expected. Look up Θ or θ in Wiktionary, the free dictionary. ^ a b Barry, Kieren (1999), The Greek Qabalah: Alphabetic Mysticism and Numerology in the Ancient World, Samuel Weiser, p. 73, ISBN 1-57863-110-6 . ^ Kaplan, Robert (2000), The Nothing that Is: A Natural History of Zero, Oxford; New York: Oxford University Press, p. 66, Bibcode:2000tnti.book.....K, ISBN 0-19-514237-3 .